Transfer by coach from Toulouse to Castelsarrasin. Passengers are welcome to board at 6:00 p.m. After you’ve settled comfortably in your cabin, we’ll introduce our crew to you before having dinner. We’ll remain in port overnight. All meals served on board. We'll leave by coach for a guided tour of Toulouse. Discover the “Pink City” and its rich architectural heritage, including the Capitole and its square, the Basilica of Saint Sernin and the imposing Church of the Jacobins. We'll visit the “Maison de Violette” to discover the delicious products made from violets - candies, chocolate, jams, sugar, liquors, teas, etc. Return to Castelsarrasin. Cruising towards Moissac. Take advantage of this time to bike along the “Green Road” that follows the canal. Before arriving in Moissac, we’ll cross over the navigable aqueduct in Cacor, with 15 arches made of bricks from Toulouse and stone from Quercy. Arriving at the end of the afternoon in Moissac. We’ll remain in port overnight. All meals served on board. Departure by coach for the guided tour of the St. Pierre and the cloister of Moissac. The cloister of St. Pierre Abbey, finished in 1100, is a unique and perfectly preserved treasure of Romanesque art. The portal of the abbey church shelters a sculptural ensemble from the beginning of the 12th century of rare splendor. This finely sculpted tympanum was featured in the film The Name of the Rose, based on the novel by Umberto Eco. At the end of our tour, we’ll taste some regional specialties, including products made from chasselas grapes. Before returning to our ship, we'll have a quick stop at the look-out point over the city, where you'll have a magnificent view of Moissac and the Tarn and Garonne rivers. Afternoon spent cruising towards Valence d’Agen. We’ll spend the afternoon cruising along the Garonne Canal. Connecting Toulouse to the Atlantic Ocean, it was created in the 19th century as an extension of the Canal du Midi. These two waterways form one remarkable result: the Canal des Deux Mers. The evening is free to do as you please. We’ll remain in port overnight. All meals served on board. Departure by coach for the excursion to Auvillar, lovely little city voted one of the most beautiful villages in France. Auvillar has a history dating back to the Romans, with its importance arising from its high location and access to the Garonne River. The city center is based around the Place de la Halle, an attractive square lined with three rows of houses dating from the 17th and 18th centuries. Other highlights in the town include the clock-tower, the church of Saint-Peter, and the chapel of Saint Catherine. A little museum marks its history, in which pottery and quills (feather pens for writing) also played a significant role. At the end of our visit, we'll enjoy a tasting of some local products. Return on board. Afternoon spent cruising. The evening is free to do as you please. We’ll remain in port overnight. All meals served on board. Guided tour of Agen's historical center and discover the richness and exceptional diversity of its cultural heritage. We’ll be able to admire the half-timbered houses and St. Caprais Cathedral, founded in the 11th century. What else to do when in the “prune capital” than have a try? Let’s visit a prune boutique and learn about this delicious regional specialty. Afterwards, enjoy some free time on your own to visit the center of town. Afternoon spent cruising towards Agen. We'll pass through the second-longest navigable aqueduct in France (1,902 feet), built entirely from stone between 1839 and 1843. 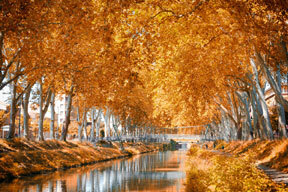 Take advantage to go by the “Green Way” of the Garonne Canal. Arriving at the end of the afternoon in Serignac-sur-Garonne. The evening is free to do as you please. We’ll remain in port overnight. All meals served on board. Departure by coach for a visit to Nérac. Lying on both sides of the Baise River, this quaint city has all the charm and ambiance of the French Southwest. The area has been inhabited since the Bronze Age and flourished during the Gallo-Roman occupation; mosaics from that era that can still be seen at the entrance of the city park and at the town hall. Wandering around the center, you’ll be able to see many attractive buildings dating from the 15th to 17th centuries. The ruins of the chateau still have a very impressive wing of the original castle, with a round tower and an arcaded balcony with decorative columns. Our visit will then continue on to Barbaste. We’ll stop and have a look at the fortified mill and the 13th-century bastide in Vianne. We’ll then visit a wine cellar and have a tasting of the local AOC wine: the Buzet. Return on board. Afternoon spent cruising. Take advantage of this afternoon spent cruising to stroll along the canal, on foot or by bike, at your own pace. Tonight is our festive gala evening. We’ll remain in port overnight. Enjoy one last buffet breakfast on board before disembarking at 9:00 a.m. Transfer by coach from Damazan to Toulouse. End of our services. Possibility of a transfer by coach from Toulouse to Damazan (with a supplement, ask for more details). Passengers are welcome to board at 6:00 p.m. After you’ve settled comfortably in your cabin, we’ll introduce our crew to you before having dinner. We’ll remain in port overnight. All meals served on board. Morning spent cruising towards Sérignac-sur-Garonne. In the afternoon, join us for a visit to Nérac. Lying on both sides of the Baise River, this quaint city has all the charm and ambiance of the French Southwest. The area has been inhabited since the Bronze Age and flourished during the Gallo-Roman occupation; mosaics from that era that can still be seen at the entrance of the city park and at the town hall. Wandering around the center, you’ll be able to see many attractive buildings dating from the 15th to 17th centuries. The ruins of the chateau still have a very impressive wing of the original castle, with a round tower and an arcaded balcony with decorative columns. Our visit will then continue on to Barbaste. We’ll stop and have a look at the fortified mill and the 13th-century bastide in Vianne. We’ll then visit a wine cellar and have a tasting of the local AOC wine: the Buzet. We’ll return on board our ship in Serignac-sur-Garonne. We’ll remain in port overnight. All meals served on board. Morning spent cruising towards Agen. We'll pass through the second-longest navigable aqueduct in France (1,902 feet), built entirely from stone between 1839 and 1843. Take advantage of this time to follow the canal along the “Green Road”. In the afternoon, guided tour of Agen's historical center and discover the richness and exceptional diversity of its cultural heritage. We’ll be able to admire the half-timbered houses and St. Caprais Cathedral, founded in the 11th century. What else to do when in the “prune capital” than have a try? Let’s visit a prune boutique and learn about this delicious regional specialty. Afterwards, enjoy some free time on your own to visit the center of town. We’ll remain in port overnight. All meals served on board. Morning spent cruising. Departure by coach for the optional excursion to Auvillar, lovely little city voted one of the most beautiful villages in France. Auvillar has a history dating back to the Romans, with its importance arising from its high location and access to the Garonne River. The city center is based around the Place de la Halle, an attractive square lined with three rows of houses dating from the 17th and 18th centuries. Other highlights in the town include the clock-tower, the church of Saint-Peter, and the chapel of Saint Catherine. A little museum marks its history, in which pottery and quills (feather pens for writing) also played a significant role. At the end of our visit, we'll enjoy a tasting of some local products. Return on board. We’ll remain in port overnight. All meals served on board. Morning spent cruising. Departure by coach for the guided tour of the St. Pierre and the cloister of Moissac. The cloister of St. Pierre Abbey, finished in 1100, is a unique and perfectly preserved treasure of Romanesque art. The portal of the abbey church shelters a sculptural ensemble from the beginning of the 12th century of rare splendor. This finely sculpted tympanum was featured in the film The Name of the Rose, based on the novel by Umberto Eco. At the end of our tour, we’ll taste some regional specialties, including products made from chasselas grapes. Before returning to our ship, we'll have a quick stop at the look-out point over the city, where you'll have a magnificent view of Moissac and the Tarn and Garonne rivers. We’ll remain in port overnight. All meals served on board. Morning spent cruising. Take advantage of this last cruise and borrow bikes on board. Along the canal, the “Green Way” offers many possibilities to stroll and ride. In the afternoon, departure by coach for the excursion of Toulouse. Discover the “Pink City” and its rich architectural heritage, including the Capitole and its square, the Basilica of Saint Sernin and the imposing Church of the Jacobins. We'll visit the “Maison de Violette” to discover the delicious products made from violets - candies, chocolate, jams, sugar, liquors, teas, etc. Return on board. Tonight is our festive gala. We’ll remain in port overnight. Possibility of a transfer by coach from Castelsarrasin to Toulouse (with a supplement, ask for more details).